Find artworks, auction results, sale prices and pictures of H. P. Aaland at auctions worldwide. 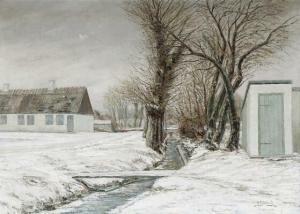 H. P. Aaland: Wintertime in Bjæverskov, Sealand. Signed H. P. Aaland Bjæverskov. Oil on canvas. 71.5×100 cm.